Hello, I am John M. Sher the owner and operator of Sher Plumbing Service. 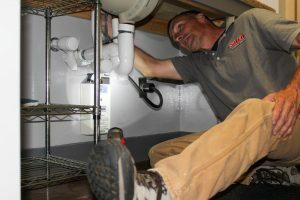 I have been involved in the Plumbing Industry since 1987. My first real job upon graduating from college was with Ferguson Enterprises. I learned a lot about the plumbing industry from the materials and the supply side. I held several positions for companies such as Bradford Sales Company and Barnett Brass. In 2002, I purchased an existing plumbing business in Charlotte, NC. We had six employees and four services trucks. We were focused on residential repair and remodeling work in Charlotte. I earned my P-1 unlimited license in 2004. We decided to pursue a different direction, and closed the company in 2005 upon moving to Hickory. I continued to work part-time and some full-time in plumbing. Since 2009, I had been working full-time for Blossman Gas Company and doing my own plumbing work on the side. Starting in 2016, it was time for me to return full-time to the trade that I know and love. I grew up in the Hickory area and graduated from St. Stephens High. I have a degree from Western Carolina University in Business Marketing. I have two children; my daughter is grown and resides in Charlotte and my son is a rising Senior at South Meck HS in Charlotte. I enjoy spending time with family and friends and doing anything outdoors like camping, fishing, biking, and running.